#100Days #3Rs Remedial Teaching Prgramme for Students Learning levels improving in AP Schools: Students Learning Levels Improvement Programme, #RemedialTeaching Schedule, Remedial Teaching Material,Teacher Handbooks and Student Workbooks for Remedial Teaching, Remedial Teaching Programme Guidelines, Remedial Teaching Programme Training, subject wise Remedial Teaching Material, 3Rs remediation/supplementary teaching in AP Schools, 3Rs Remediation Programme in AP schools. 3. Remedial Teaching Programme is meant for the D1, D2 grade students of classes I – IX. 4. Remedial Teaching Material – Teacher Handbook and Students Workbook - will be supply to all DEOs in the form of soft copy and the same is placed in SCERT website. 1. The second spell of 100 days Remedial teaching programme will be continue after re-opening of the schools for the next Academic Year i.e., 13-06-2017. 2. Remaining 82 days of Remedial Teaching Programme will be continued along with regular academics. Every working day 2 hours will be allotted for Remedial Teaching @ 40 minutes per subject. 1. 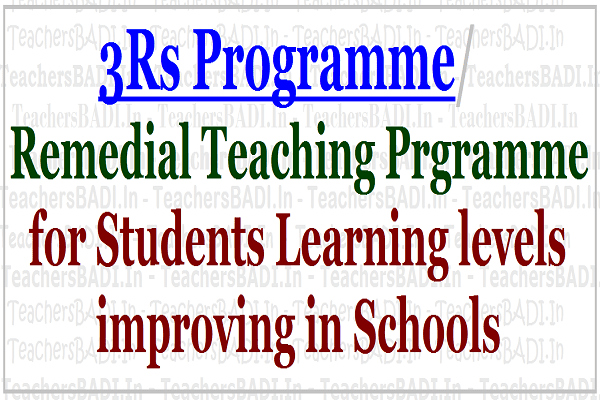 What is 3Rs Remedial Teaching Programme(RTP)? : Remedial Teaching Programme is to provide Remedial Teaching for D2 grade students from class I - IX and to enhance the achievement levels of students who are lagging behind in their Academic Standards related to their class specific age. Remedial Teaching is a 200 hours programme which will be completed in 100 working days. 2. When will be conducted? : Remedial Teaching Programme to be conducted in AP Schools after completion of SA-III examinations and After re-opening of the schools. 3. How many Spells to be taken? : Remedial Teaching Programme will be will be implemented in two spells for three subjects i.e., Telugu, English and Mathematics. Spell II Remedial Teaching Programme Schedule: In spell-II remaining 82 days of Remedial Teaching Programme will be continued after re-opening of the schools along with regular academics. Rc.No.145,Dated:02-03-2017:: Subject: SCERT Andhra Pradesh - Calendar Activities - Improving Learning Levels of the Students - Implementation of Remedial Teaching from class I - IX - from 28-3-2017 to 22-4-2017- Orders - Issued - Reg. Reference:1. PAB Meetings communicated vide Lr.F. No. 14-1/2016/RMSA-I, dated: 31-5-2016 GoI, MHRD, New Delhi., 2. C.No.1250/AWP&B/7-3/RMSA, AP/2016., 3. C. No. 145 /B/C&T/SCERT/2016. Department of School Education endeavour to provide Quality Education for all children. You aware of the FA, SA, 3R, SLAS, NAS and other Assessment surveys undertaken in the State of Andhra Pradesh. The data of students performance marks is being uploaded to Student Academic Monitoring System (SAMS). Analysis of the SAMS data shows that a large number of students do not have minimum academic standards of their respective classes. In the above context it is proposed to provide Remedial Teaching for D2 grade students from class I - IX. The main objective of Remedial Teaching is to enhance the achievement levels of students who are lagging behind in their Academic Standards related to their class specific age. Remedial Teaching is a 200 hours programme which will be completed in 100 working days. This will be implemented in two spells for three subjects i.e., Telugu, English and Mathematics. Spell - I Remedial Teaching is scheduled during morning schools and all the schools works from 8.00 am to 12.30 noon. So we have 4 1/2 working hours per day. The, 4 1/2 working hours per day will be divided into 3 sessions. Remedial teaching in the subjects of Telugu, Mathematics and English @ 1 1/2 hours per subject. Nearly 27 working hours are available per subject. You are also aware that SA-III examinations are scheduled to be held from 14-3-2017 to 27-3-2017. The remaining ts working days i.e., 28-3-2017 to 22-4-2017 to be utilized for conduct of Spell - I Remedial Teaching in all the Schools from class I - IX. In spell-II remaining 82 days of Remedial Teaching Programme will be continued after re-opening of the schools along with regular academics. In each working day 2 hours will be allotted for Remedial Teaching@ 40 minutes per subject. During summer MDM will be provide the students in the drought mandals schools. Spell-II of the Remedial Teaching will be continued during summer in these schools. SCERT has developed Teacher Handbooks and Student Workbooks for the conduct of Remedial Teaching in all the Schools from class I- IX. Printing and supply of the Teacher Handbooks and Student Workbooks is in process with support of RMSA and SSA. One set of Teacher Handbooks will be reached to all Government Schools by 20-3-2017. Meanwhile soft copies of Remedial Teaching Material will be supplied to all the District Educational Officers, and they are informed to place the Remedial Teaching Material in their respective district websites ensure downloading by the schools and utilized. Further, all the DEOs are informed to communicate the detailed guidelines for smooth conduct of Remedial Teaching Programme in all schools without any deviation and also informed to ensure strict monitoring.